Babaji Datey in Ram Shewalkar’s words. 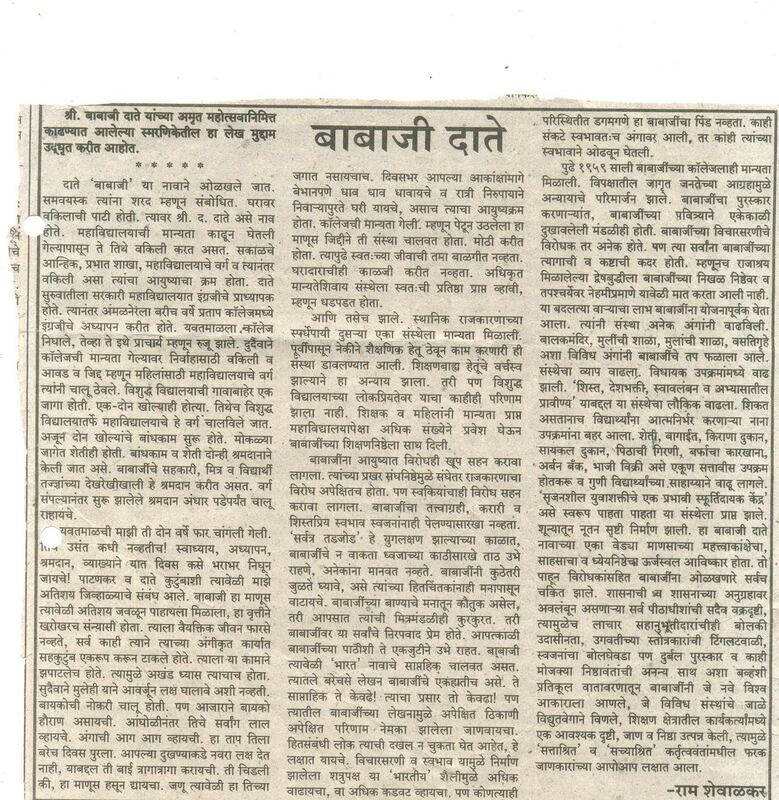 “Babaji Datey” , an article written by a noted Marathi writer, poet and orator, Ram Shewalkar was published in a “Tarun Bharat” on 1989 in celebration of Babaji Datey’s 75ths birthday ( अमृत महोत्सव ). Shrikrishna Dattatraya Datey, popularly known as Babaji Datey, worked as a lecturer in colleges in Maharshtra, India before he came back to Yavatmal (a district place) as a Principal of a local college. Unfortunately, the college was shut down after two years. He did practice law for some time, but his passion for teaching did not let him live in peace. He started a private college for girls in two rooms. With the help of his friend and students , few more rooms were constructed . Students used to work at construction site after the classes. The college was not recognised by the University. He continued to run the college against all financial and political odds. Soon the college became famous and very popular among students because of its high quality education and discipline. My two years as lecturer in the college were most gratifying and fulfilling. Lectures, studies, seminars. , working at construction site used to keep us extremely busy . During these years , I got to work with and know Babaji from close quarters. He was a sage in true sense. He did not have personal life as such. His work-life was inclusive of his family life. During day, he used to run after his dream and used to come home only to sleep. After his relentless efforts and support of well wishers, the college was recognised by the university in 1959 as a commerce college. Being a staunch supporter of Rashtriya Swayamsevkak Sangh (RSS), an non government organisation that promoted Indian culture , civilisation and ideology, Babaji had to put up with lot of resistance and opposition at every step he was taking for building the educational institutions. Grants from government were not easily made available and the necessary permission to start a new institute was not forthcoming or unduly delayed. However, due to his dedication, perseverance, hard work, selfless service, discipline, integrity and good results of the institutions , the opposition had to melt down and his work started getting appreciated. The necessary grants and permissions followed. He never compromised with his principles. He was man of high integrity. He never bent before those in power. He was fearless and a fighter to the core. At times, his well wishers and friends also found it difficult to cope up with his strict discipline and work ethics. They wished he should compromise a bit. Never-the-less , they loved and always supported him. He also started a weekly news bulletin “Bharat” to put forward his views and scathing attack on the then existing political and government system. Babaji used this support to expand his work. He started separate schools for girls and boys and a play school for kids. These institutes also became very popular and started growing. He also provided hostel facilities for girls and boys at bare minimum rates. He implemented various ventures with the aim of providing employment to poor students and help them in the process of “earn and learn”. His education Society started 27 ventures including saw mill, printing press, ice factory, laundry, floor mill, grocery shop, vegetable shop and helped several students to earn and continue their education. Out of nothing, Babaji created a large network of educational institutions in spite of adversities. Every one, including his opponents, was awe-struck by courage and integrity of this crazy man who worked relentlessly to achieve a mission– to create education facilities for poor.